Character meals are one of those experiences that you and your friends and family will cherish for a lifetime. From sharing a meal with all the royal princesses to eating with Chef Mickey himself, there are a lot of great Disney World character meal options available. There’s just a few things you need to figure out first before you make your decision. Some restaurants offer character meals for both lunch and dinner. However, some of these restaurants like 1900 Park Fare at the Grand Floridian have different characters for breakfast and different ones for dinner. So if you’re looking for a particular character, be sure to make sure that they’ll be there during that time of the day. Also, just because a restaurant has characters in the morning, doesn’t necessarily mean that they’ll be there for dinner as well. For example, Ohana’s character breakfast includes Mickey, Pluto, Lilo, and Stitch. But for dinner, Ohana transforms to a whole different restaurant and dining experience minus the characters. So just make sure that the time of day you pick is also a designated character meal time. Breakfast Food or Dinner Food? Food is another important aspect when it comes to choosing the best Disney World character meal. Sure the characters are the main reason you’re there but food is just as important (to me at least). And just from personal experiences, if a character meal has the same characters for breakfast, lunch, and dinner, then I recommend not going for breakfast only because the food is different than what you’ll find at a typical restaurant that serves breakfast at Disney World. But hey, if you love breakfast food, then don’t let me stop you. Plus, breakfast is always cheaper! Are there any particular characters that you want to see during your character meal? If so then it’s important to know where they’re located. The last thing you’ll want to do is go to Chef Mickey’s hoping to see Lilo and Stitch. Want to know who’s going to be at each character meal at every time of the day? 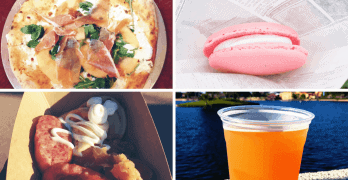 Then be sure to check out this in-depth guide to the best Disney World character meals! One of the best things about the normal Disney Dining Plan and everything above is that you can actually use 1 table service credit to dine there! But one thing to remember is that 1 table service credit is good for both a character breakfast and character dinner. So if you’re trying to truly maximize your credits, I recommend using your table service credit on a dinner as opposed to breakfast because the overall cost of dinner is generally higher than breakfast at Disney World. And if you’re curious, here are some of the best restaurants for the DDP to get the most bang for your buck when it comes to table service credits. Last but not least, don’t forget to make advanced reservations for your character dining experience. Making advanced reservations is one of the most important things to do when trying to dine at a character meal. You can book these character meals up to 180 days in advanced so it’s best to book them as soon as possible. Although there are times of the year when you can just walk up and get a table at 6 pm or 9 am for breakfast, it’s very rare, difficult, and risky. So be sure to make advanced dining reservations! Check out this quick in-depth guide. Thanks for reading and hopefully you’re able to choose the best character meal possible at Walt Disney World. Plus be sure to follow me on Instagram if you need some food and drink recommendations that you can add to your Disney World food bucket list.